Chevrolet quietly launched a special edition C7 Corvette in Europe on Wednesday, and it could be the beginning of the end for the current-generation car. 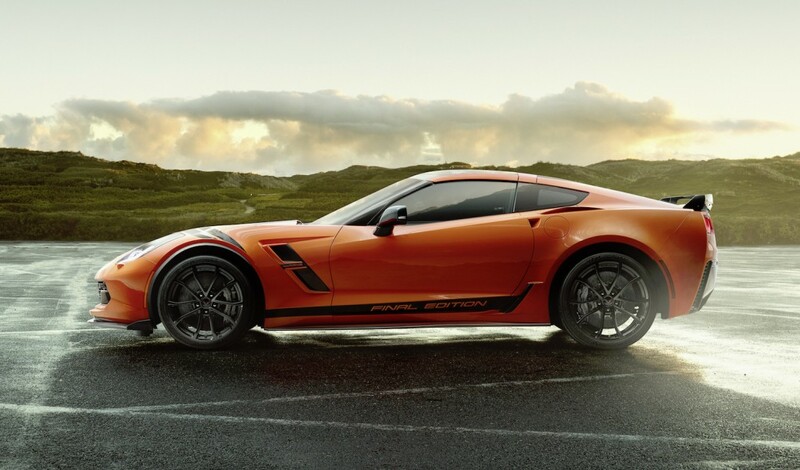 Chevrolet Europe released the C7 Corvette Final Edition, which bundles some of the best performance attributes into one package available for the Grand Sport or Z06 models. The C7 Corvette Final Edition receives Brembo carbon-ceramic brakes, Competition sport seats, a performance data recorder, chassis calibration “optimized for race tracks” and the Z07 package for some versions. European buyers will have the option to finish their Final Edition in Sebring Orange Tintcoat Metallic or Ceramic Matrix Gray Metallic. Inside, the car receives a black interior with leather and high-gloss carbon-fiber interior trim. Either blue or orange color-contrast stitching is available depending on which exterior color a buyer chooses. Other available features include a carbon-fiber exterior aero package, which adds a carbon-fiber front splitter and side skirts, and Carbon Flash hash marks on the front fenders for Grand Sport models. “With this special edition, we aim to honor the current generation, which has once more contributed greatly to the history of the Corvette series,” says Felix Weller, Vice President Cadillac and Chevrolet Performance Cars Europe. While Chevrolet Europe didn’t explicitly say it, it’s clear this is the beginning of a parade lap for the C7-generation model. The C8 mid-engine Corvette remains the brand’s worst-kept secret, and we’ve heard the car could debut as early as this May after a delay due to electrical issues. Surely, the U.S. market will also receive its own send-off edition for the car in the months to come. Europeans can purchase their own Corvette Final Edition now for $133,700 USD at current exchange rates. Lame send off!!!!!!! How many of us have had a chance to buy a ZR-1 yet??????? One more year for the ZR-1 body style, anyway!!!!!!! End of the line for the C7. A bit premature. If it is… the, so called, C8, will be the Swan Song for the Corvette. Bye, bye America’s Sports Car. I don’t see how Corvette leadership can make a business case for building and selling a few hundred C7s in Europe. “Final Edition” in my mind could very well signal no more corvettes for euros. Can the C8 even be designed and constructed to meet the current euro standards much less anything tougher coming down the road in a couple years?